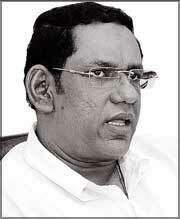 President Mahinda Rajapaksa in a condolence message on the demise of former minister and Kegalle District Parliamentarian Mano Wijeyeratne yesterday said that the late Parliamentarian became popular among the people of the Dedigama electorate due to his humbleness, honesty and philanthropy. ‘The late Parliamentarian Wijeyeratne, irrespective of his political affiliations expressed his support to the government when it was engaged in a mission to eradicate terrorism in the country. “He had an indepth understanding of the mission that was being carried out by the government to save the country from terrorism and he strengthened the government at that crucial juncture. “He earned honour from the Sri Lanka Freedom Party and the whole nation. The late Parliamentarian always kept the country’s progress ahead of him. ‘He always commended the vast strides taken by the government after the country was liberated from clutches of terrorism. ‘Later the late Wijeyeratne helped achieve the aspirations of people as a member of President’s staff. ‘His untimely death is an irreparable loss to the country and the people of the Kegalle district. “I convey my deepest sympathies to his widow Bharathi Wijeyeratne, children and relatives,” the message adds.